Astronomy and Space News - Astro Watch: How Hot Are Atoms in the Shock Wave of an Exploding Star? A new method to measure the temperature of atoms during the explosive death of a star will help scientists understand the shock wave that occurs as a result of this supernova explosion. An international team of researchers, including a Penn State scientist, combined observations of a nearby supernova remnant--the structure remaining after a star's explosion--with simulations in order to measure the temperature of slow-moving gas atoms surrounding the star as they are heated by the material propelled outward by the blast. The research team analyzed long-term observations of the nearby supernova remnant SN1987A using NASA's Chandra X-ray Observatory and created a model describing the supernova. The team confirmed that the temperature of even the heaviest atoms--which had not yet been investigated--is related to their atomic weight, answering a long-standing question about shock waves and providing important information about their physical processes. A paper describing the results appears January 21, 2019, in the journal Nature Astronomy. "Supernova explosions and their remnants provide cosmic laboratories that enable us to explore physics in extreme conditions that cannot be duplicated on Earth," said David Burrows, professor of astronomy and astrophysics at Penn State and an author of the paper. "Modern astronomical telescopes and instrumentation, both ground-based and space-based, have allowed us to perform detailed studies of supernova remnants in our galaxy and nearby galaxies. We have performed regular observations of supernova remnant SN1987A using NASA's Chandra X-ray Observatory, the best X-ray telescope in the world, since shortly after Chandra was launched in 1999, and used simulations to answer longstanding questions about shock waves." The explosive death of a massive star like SN1987A propels material outwards at speeds of up to one tenth the speed of light, pushing shock waves into the surrounding interstellar gas. Researchers are particularly interested in the shock front, the abrupt transition between the supersonic explosion and the relatively slow-moving gas surrounding the star. The shock front heats this cool slow-moving gas to millions of degrees--temperatures high enough for the gas to emit X-rays detectable from Earth. "The transition is similar to one observed in a kitchen sink when a high-speed stream of water hits the sink basin, flowing smoothly outward until it abruptly jumps in height and becomes turbulent," said Burrows. "Shock fronts have been studied extensively in the Earth's atmosphere, where they occur over an extremely narrow region. But in space, shock transitions are gradual and may not affect atoms of all elements the same way." The research team, led by Marco Miceli and Salvatore Orlando of the University of Palermo, Italy, measured the temperatures of different elements behind the shock front, which will improve understanding of the physics of the shock process. These temperatures are expected to be proportional to the elements' atomic weight, but the temperatures are difficult to measure accurately. Previous studies have led to conflicting results regarding this relationship, and have failed to include heavy elements with high atomic weights. The research team turned to supernova SN1987A to help address this dilemma. Supernova SN1987A, which is located in the nearby constellation called the Large Magellanic Cloud, was the first supernova visible to the naked eye since Kepler's Supernova in 1604. It is also the first to be studied in detail with modern astronomical instruments. The light from its explosion first reached earth on February 23, 1987, and since then it has been observed at all wavelengths of light, from radio waves to X-rays and gamma waves. The research team used these observations to build a model describing the supernova. 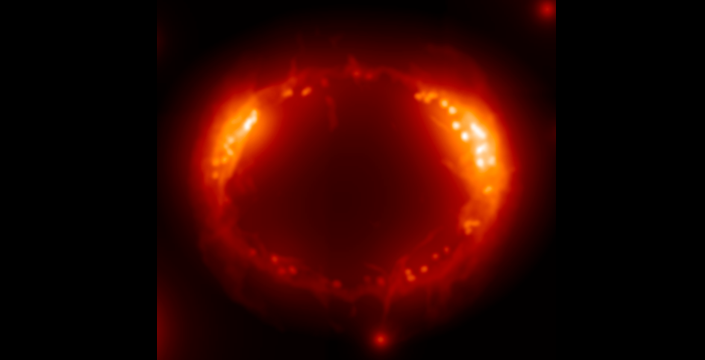 Models of SN1987A have typically focused on single observations, but in this study, the researchers used three-dimensional numerical simulations to incorporate the evolution of the supernova, from its onset to the current age. A comparison of the X-ray observations and the model allowed the researchers to accurately measure atomic temperatures of different elements with a wide range of atomic weights, and to confirm the relationship that predicts the temperature reached by each type of atom in the interstellar gas. "We can now accurately measure the temperatures of elements as heavy as silicon and iron, and have shown that they indeed do follow the relationship that the temperature of each element is proportional to the atomic weight of that element," said Burrows. "This result settles an important issue in the understanding of astrophysical shock waves and improves our understanding of the shock process."